Find out why these stocks held back this red-hot index. The stock market has done well in 2017, and the Nasdaq 100 has been a big contributor to the overall market's gains. With a rise of 16% in the first half of the year, the Nasdaq 100 has doubled the performance of the broader market, and tech stocks have been a big part of that outperformance. However, some stocks haven't participated in the rally and have suffered losses that have held back the Nasdaq 100 from even bigger gains. 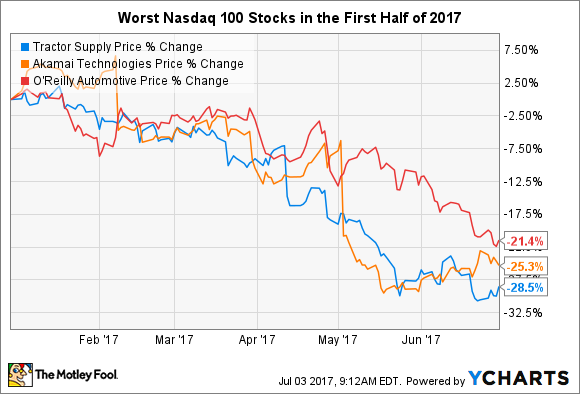 In particular, Tractor Supply (NASDAQ:TSCO), Akamai Technologies (NASDAQ:AKAM), and O'Reilly Automotive (NASDAQ:ORLY) have all lost at least a fifth of their value so far in 2017, and investors aren't certain about what lies ahead for them in the future. Tractor Supply has been in growth mode for a long time, and the retailer of lawn and garden and pet and livestock products has continued to expand its network of stores across the nation. In its most recent quarter, Tractor Supply added 24 new locations to its total, which now includes more than 1,600 stores. However, the net impact of Tractor Supply's store count growth hasn't been as favorable lately. The first quarter of 2017 brought just a 7% rise in revenue, and comparable-store sales dropped more than 2% on Tractor Supply's first decline in customer traffic in nine years. Although mainstay pet and livestock demand was solid, poor seasonal weather conditions throughout much of its core territory had a downward impact on lawn and garden sales. Higher internal costs also ate into profit, and rising inventory reflected the sluggish sales conditions for the business. If weather starts getting more favorable, then Tractor Supply could bounce back, and a recent dividend increase shows the company's confidence in its own business prospects. Akamai Technologies has made a specialty out of optimizing distribution of content over the internet, and for years, the need to maximize efficient transfer of data has given Akamai a growing business. Yet lately, the company has seen a slowdown in revenue related to media, and that has brought down Akamai's overall growth rate. In the first quarter, Akamai's 7% growth in sales led to a 5% rise adjusted earnings, and both numbers were actually better than investors had expected. Going forward, Akamai is also being cautious. Guidance for the second quarter was less than investors had expected, and although the company sees itself staying in the media distribution business for the foreseeable future, that space is getting increasingly competitive. Bullish investors hope Akamai can bounce back on the strength of its rising security services business, but whether that can provide a share-price-increasing boost in the second half of the year is far from certain. Finally, O'Reilly Automotive has also posted substantial losses so far this year. Auto parts stores in general have seen poor performance in 2017, and O'Reilly's losses only make a small dent in its long-term returns over the past several years. The auto parts retailer's first-quarter results didn't inspire a huge amount of confidence among investors, with sales climbing less than 3%, and net income growing at a 4% clip. Industry watchers pointed to adverse weather conditions and a delay in tax refunds as contributing factors to the poor performance for the quarter, and a mild winter reduced the need for repairs even as a cool spring discouraged people from heading out to their garages to do work. Yet O'Reilly has done a good job of reducing its share count, including a 5% drop in just the past year. That has helped bolster growth in earnings per share, and if the company can take advantage of the recent price drop to pick up shares on the cheap, then buybacks could add even more to longer-term gains for O'Reilly going forward. The Nasdaq 100 has done well this year, but these three stocks haven't been able to join in the party. If they can make the necessary moves to improve their business performances, then their stock prices could finally recover and start contributing to the overall market's gains going forward. Is Akamai Technologies, Inc. a Buy?